With only 25% of companies actually engaging in it, Static testing is frequently overlooked as a viable option. Many assume the time that would be spent static testing would be better spent on design or coding. They are correct that static testing is time consuming, can be costly, and that it requires complete buy-in from the management team. While not always easy, static testing is not nearly as costly as fixing the defects introduced by skipping this important step. Introduced right after the requirements gathering phase, static testing is crucial if you want to reduce the number of defects introduced to the system or application under test. After this course you will be able to use your own static testing methodology that can be implemented at any organization. You'll leverage QA Mentor's proprietary checklists to validate and verify every single artifact in the Software Development Life Cycle. You'll also learn how to easily show your management the potential Return on Investment (ROI) before the process begins, and then show them exact ROI afterwards. And believe me, they will be shocked on how much money you will save the company! You should know that the cost of a defect found during traditional testing is about 10-20x the cost of one found in static testing. That may seem exaggerated, but here's why that's true. It takes longer to fix a defect once it's been coded into a functioning system. Finding the defect may take hours of a tester's time, then additional hours to fix the defect that could involve more than one developer or DBA. Next, the fix must be verified by a tester once more. All totaled, a defect found during traditional testing can take 5 – 20 hours (or more) to fix and verify. Contrast that with finding that same defect in static testing. Fixing it requires no code changes and only takes 30 – 60 minutes, sometimes even less so the difference in cost is dramatic. In this 10 video lectures e-learning course, you will learn how to implement a static testing phase within your Software Development Life Cycle. You will learn how to start application testing before a single line of code is written and identify issues that would potentially be converted into functional defects if not detected in the Static Testing Phase. You'll learn the entire methodology behind inspection methods and static testing on business requirements, functional requirements, design documentations, prototypes, wireframes, use cases, etc. Your will receive 4 complimentary static testing checklists which you can use to inspect and validate Use Cases, Functional Requirements, Prototype and Code Reviews. Also as a bonus you will have a direct interaction with CEO of QA Mentor Ruslan Desyatnikov by asking any questions relating to course material via email. You'll learn the principal of shift-left testing, something few companies fully understand or are willing to invest in, and how to calculate ROI on static testing and impress your senior management. Find out how QA Mentor's CEO Ruslan Desyatnikov was able to save one company over 10 million dollars using these principals and methods by stopping design and development of multi-year platform while using static testing techniques. These are only a few of the many things you will learn that are based on real, hands-on experience instead of just textbook theories. 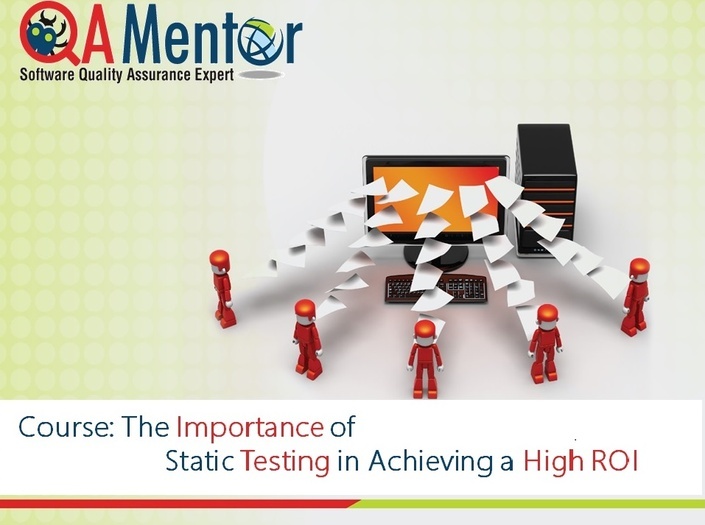 Ruslan Desyatnikov is eager to share his secrets of Static Testing, gleaned from nearly 20 years of active QA experience implementing static testing in companies such as HSBC, Citi, Sterling and several other fortune 100 companies. Invest in yourself and your future! You will be glad that you did. Ruslan Desyatnikov is a CEO of QA Mentor, Inc, brings nearly 20 years of Quality Assurance, Quality Control, Process Improvement and Software Testing experience. He is responsible for growing QA Mentor as a trusted partner for software testing, independent verification and validation, and strategic consulting for client base around the world. Prior to expanding operations at QA Mentor, Ruslan worked at Citi for 3 years as the Global Head of Testing of Worldlink Technology. He was responsible for both System testing and System Integration testing phases including functional, performance and automation testing of the WorldLink Global Payment System. This system generates more than $325 million in annual revenue and more than $220 million in net income while offering world class cross-border payment solutions in 150 countries and serving more than 4000 large corporations and government agencies. This unique course is the only one that teaches you how to calculate the real ROI on static testing. Since it's the first e-learning course developed by QA Mentor ( www.qamentor.com), we're offering a low introductory price to help you invest in yourself and your future. This skillfully designed course with professional voice, video animation, educational material development, case studies, and quizzes after each lecture will teach you how to improve quality right from the beginning of the SDLC. Experience with static testing techniques increases your value as a QA Professional and make you stand out from others who have never heard of static testing. Enroll now, you will be glad you did.